The valuation placed on your property is determined by the Harrison County Auditor as required by law (ORC 5713.01). The Auditor calculates tax rates based on public votes on tax levies and inside millage. The Treasurer's Office only collects taxes and does not determine property values. Where is your office and when are you open? We are located at 100 W. Mkt St in the Courthouse on the main floor. Our office hours are 8:30 am to 4:30 pm, Monday through Friday, closed Federal Holidays. I received my tax bill in the mail. It is suppose to be paid by my bank. What do I do? This commonly happens if you have recently refinanced or have in any way changed the information on your tax bill. We suggest you immediately forward the tax bill to your lender. To correct our records, please forward in writing the name of your lender, their address and your loan number. I received a bill for property I just sold, what should I do? Normally at the time of closing, taxes are pro-rated to the new owner and the seller is no longer responsible for the payment of any further taxes. Please forward the bill to the new owner OR contact our office so that we can prepare another bill to be sent to the responsible taxpayer. I have received a bill for property I just purchased and I noticed the bill states it is for last year, am I responsible for the payment of these taxes? In the State of Ohio, real estate taxes are collected one year behind. Therefore, in 2015 we collect for 2014, 2016 we collect for 2015 etc. You will need to check your closing statement or with your closing agent to determine if you are to pay this bill but normally taxes are pro-rated to the new owner at the time of the sale. Any tax that comes due after your purchase date then becomes your liability to pay. I didn&squot;t receive a tax bill, what should I do? It is the taxpayer’s responsibility to notify the Treasurer’s office of any address change for billing purposes. Please contact our office by email (vsefsick@co.harrison.oh.us) or by phone(740-942-8864). Tax bills are always mailed in January and June. Please contact our office immediately if you do not receive your tax statement. How are my real estate taxes calculated? 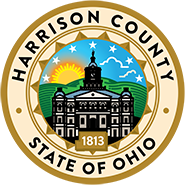 As required by the Ohio Revised, the Auditor’s office establishes a market value for all properties in Harrison County. The full year real estate tax is then computed by first multiplying the assessed value (35% of the market value) by the total tax rate of the district in which the property is located. This gross tax is then multiplied by the district reduction factor (either residential/agricultural OR commercial/industrial) to determine the reduction credit. The reduction credit is subtracted from the gross tax giving you the net tax amount. Residential and Agricultural properties receive a 10% credit from the net amount. Owner occupied property is eligible for an additional 2 ½% credit on the assessed value of the home and the homesite (up to one acre). Taxpayers eligible for the homestead exemption (applications can be obtained at the County Auditor’s office) will have an additional credit. The net tax, minus all credits and plus any special assessments, is the balance owed for the full year. If I mail my tax payment on the due date, is it going to be late? No. The Ohio Revised Code states that the Postmark or Postal Cancellation of the due date is considered to be timely paid. A private metered date of the due date is not sufficient. We are required to use the US Postal Cancellation date. How do you calculate the penalty on late payments? After the first half due date, 10% of the unpaid current tax is added as penalty. If payment is received within 10 days of the due date, 5% of the penalty is removed. After the second half due date, 10% of any unpaid current tax/penalty is added as penalty. If payment is received within 10 days of the due date, 5% of the penalty is removed. On August 1 of each year, interest as mandated by State Law (refer to tax rate sheet) is charged only on the prior taxes due. On December 1 of each year, the balance of interest is charged against the total amount due. What happens if I do not pay my real estate taxes? If the tax is not paid and has just gone delinquent, your name will appear in the Delinquent Tax List that is published in the local paper. If the tax is not paid by the next November, it is certified to the County Prosecutor to start foreclosure actions. Can I pay my delinquent tax in payments? Can I pay my Real Estate taxes with a credit card or debit card? Yes. Payment can only be made in office or over the phone. Payment by credit/debit cards will incur a convenience fee of 3% Minimum charge is $2.50 These fees are not paid to the Government Entity; they are paid to Lexus Nexus for processing the transaction. The County does not profit from this convenience fee. May I pay my half-year tax bill in more than one payment? Yes, as long as paid in full before the due date.